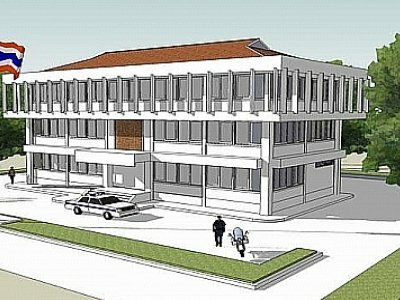 PHUKET: Work is underway on the headquarters of Phuket’s newest police station, with some officers already taking up residence in barracks near what will eventually be the Wichit Police Station. The work follows an announcement by Phuket Provincial Police in early 2009 that it planned to establish two new independent police precincts in the south of the island. The move is intended to take pressure off Chalong Police, whose jurisdiction currently covers all of Chalong, as well as Rawai and Karon subdistricts. Under the plan Karon will get its own police department, with 83 officers. Also benefiting would be Phuket City Police, whose current turf covers Wichit, Rassada and Koh Kaew as well as Phuket Town. When opened the new Wichit Police District will have 94 officers. Although police have taken possession of land donated by the private sector for both projects, they are still awaiting the bulk of the funding for the building construction. This will amount to 28.7 million baht in the case of the Wichit District Police Station, to be located on 2 rai of land off Chao Fah West southbound. However, a 1.2mn baht barracks is already completed at the site and some Phuket City Police officers have already taken up residence there. A source at Phuket Provincial Police said the Karon District Police office would be built on 2 rai of donated land near the Hilton Arcadia Phuket Resort. “Although initial costs estimates have yet to be made, construction costs are expected to be about the same as for the facility in Wichit,” he said. “However, funding for both projects remains delayed, probably due to the flooding in central Thailand,” he added. The new Wichit Police Station lies on two rai of the vast landholdings of the Anupas & Sons company.